Happy Hanukkah Oreo? Cookies is rated 4.0 out of 5 by 1. Rated 4 out of 5 by majar from Gift Box Politically Correct & Delicious! I ordered this gift cookies for relatives who said they were delicious. One is lactose intolerant and was able to enjoy the treat! Make the Festival of Lights a little sweeter by sending these exquisite treats! We've taken classic Oreo® Cookies and dipped each one by hand into baths of exquisitely smooth imported Belgian chocolate. 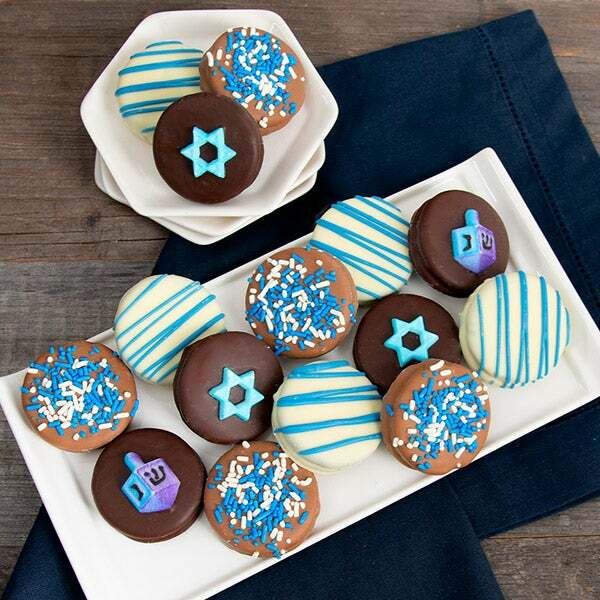 Each treat is then elegantly decorated with either Hanukkah-themed candies or ribbons of bright, silky confection.